What follows is the text portion of “Collecting Frye’s Thoughts,” a story by Mike Landry, from the New Brunswick Telegraph-Journal, part of a special feature on Northrop Frye (April 21, 2012). Mike Landry is the Telegraph-Journal’s arts and culture editor. He can be reached at landry.michael@telegraphjournal.com. Now retired in Emory, Va., former professor Robert D. Denham has dedicated decades of his career to compiling and then annotating Frye’s bibliography. In the process, he has assembled an extensive and unparalleled near nine-metre library of Frye-related material, which he hopes to donate to the Moncton library. In the southwestern corner of Virginia, a 30-minute drive north of Tennessee and North Carolina, about 850 metres above sea level in the Blue Ridge Mountains, is Northrop Frye country. To say it’s an unlikely home for the world-renowned Canadian literary theorist would be an understatement. It’s inconceivable that the tiny town of Emory, Va., 1,000 kilometres from Toronto, would account for arguably the most impressive personal library of Northrop Frye’s work. Frye visited the town only once, for two days, in 1979, to give The Reynolds Lectures at Emory & Henry College. And while snow is still melting from Frye’s old stomping grounds in Moncton in early April, those in Emory are busy mowing their lawns. Yet, in the study of Robert D. Denham’s home in Emory, almost nine metres of shelf space is allocated to Frye. It takes almost 40 pages to list all the books, monographs, journals and offprints in Denham’s collection. It’s so extensive, the two editions of Anatomy of Criticism not in the collection are a translation from Tunisia and an Italian edition from a print run that was destroyed by the publisher. Add then, not measured on his shelves, are the eight videotapes and 56 audiotapes Denham has collected. Nor included is what Denham refers to as ‘Frygiana’: Frye’s writing desk and chair; a silver bowl, presented to Frye on the occasion of his giving the Jacobs Lecture at Columbia University; a bronze bust of Frye by Hanna Boos; and more than 50 other items of miscellany. A former John P. Fishwick Professor of English Emeritus at Roanoke College, just east of Emory in Salem, Va., Denham published his enumerative bibliography of Northrop Frye in 1974. 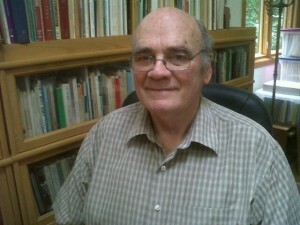 He then collaborated with the University of Toronto Press to publish an annotated bibliography in 1987. Denham has been involved in editing nine of the 30 Collected Works of Northrop Frye. He’s put his collection to good use, and Denham wants to make it available to the wider public. He contacted the Frye Festival last fall about donating his Frye material to the Moncton Public Library, and in May someone from Moncton is heading down to assess the collection. In addition to his primary sources, Denham is also sending his hundreds and hundreds of secondary sources relating to Frye. Denham hopes to turn the Moncton library into a centre for Frye studies – one of the few places someone so inclined could find not only a signed 1947 copy of Fearful Symmetry, but an edition in one of 19 languages and its reviews from across the decades and the world over. “He’s not on the lips of every post-structuralist thinker, but someone is thinking about him out there,” Denham says regarding Frye’s enduring appeal. A study he did a few years ago documented the rise in secondary sources about Frye, and his prevalence in hundreds of school curricula. Denham purchased his first Frye book, Anatomy of Criticism, on a whim in the early ’60s while browsing the shelves of the University of Chicago bookstore. He had only recently come across literary criticism while pursuing an MA in religion and art. He wouldn’t read the book until he had left to serve in the army in 1964. By the time he returned to the University of Chicago to complete his PhD in 1970, he decided to write his dissertation on Frye’s critical method. He was drawn to specializing in history and theory of criticism as he felt it would be a good base for an undergraduate professor. Traditionally, then, dissertations were written on dead thinkers, but Denham’s supervisor was interested in critical theory and had invited Frye to lecture in ’68. This entry was posted in Uncategorized on June 4, 2012 by Joseph Adamson.